When interest rates stay low for an extended period of time, it’s a sign that they will rise up sharply. This usually happens when the economy is coming out of a recession. Fixed-income investors are bound to miss out on an easy chance to raise their income levels. Therefore, you must always prepare in advance and keep a keen eye on the rates. We will try to explore how rates work across multiple investment options and help you make an informed decision about investing your hard earned money. With any loan that goes up at a prime rate, you should consider paying it off immediately. If you can’t do that, you must at least convert it into a fixed-rate loan. Mortgages, auto businesses, and all sorts of personal loans work on variable rates that are susceptible to increment at any time. It best to pay them off as soon as possible. The bond market is worse affected by rising rates. Anyone who has invested in bonds would lose money in such a scenario. The trend usually continues as rates go up, so it is wise to keep bonds off limit. However, a bond ladder is something that you can try your hands with. A bond ladder represents a sequence of bonds which mature after regular intervals. The intervals are usually 3, 6, 9 or 12 months. As the interest rates continue to go up, you continue reinvesting these bonds at a higher rate. At the end, you are going to end up with a considerable return on investment. A certificate of deposits allows you to lock money in at a higher rate of return, in the consequence of not being able to access it for a certain duration of time. There is always a risk with this sort of investment as your money is locked and you never know when the rates start to jump around. The same bond ladder principal can also be applied on CDs and it is often a good investment option. There is a penalty on withdrawals and, usually, it’s pretty high. Ensure to check for penalties before locking the money up. Saving accounts respond directly to rising interest rates. Staying afloat in times of inflation is hard for savers and rising rates can feel like a cold breeze after a humid day. People who are holding up foreign currencies may reconsider beefing up their dollar stacks as rates start to go up. Higher rates mean more foreign capital into investment instruments, which eventually raise the value of the dollar. Government-owned financial instruments are most favored by people as they are more secure and give away consistent yields. Gold and other tangible assets do really well when the interest rates are low and inflation is on the rise. Rising rates also affect your investments which are hedged against inflation; rising interest rates mean a decline in inflation. Other natural resources, such as oil, are also affected by rising rates and investors should shift their focus to investing in stocks rather than commodities. Credit card interest rates usually remain high throughout and tend to rise even more when other rates go up. It is never a good option to miss a payment on your credit card loan even when the rates are not high. It is one of the smartest money moves you could make to pay off your credit card debt in a timely manner. A high-quality credit history is always good but, when the rates are high, it is vital to have a clean slate. Any kind of auto loan, mortgage, and personal loan is hard to get with a red flag on your credit report. Keep your credit report stainless with a steady payment plan. Invest in stocks of major consumers that use large volumes of raw material. The prices of raw materials usually tend to stay the same or decline when the interest rates go up. Companies that are using raw materials will see a significant decrease in their costs and their profit margins rise. They can act as your hedge against rising rates. The real estate sector also sees growth when the rates are up and same is the case with beef and poultry industries. Their demand can significantly rise due to the increased spending on low-cost goods. 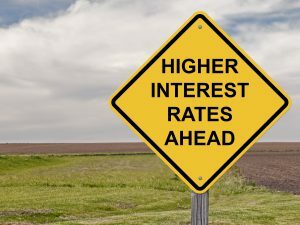 Higher interest rates bring opportunities for those who act quickly and can wreak havoc for people who are under prepared.